Note:Drain and measure as much of the refrigerant oil as possiblefrom the removed compressor. 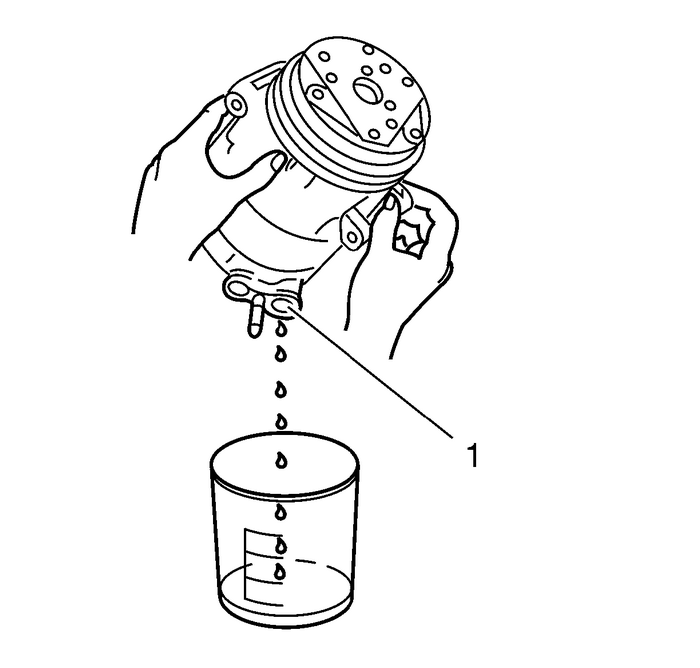 Remove the compressor crankcase oil drain plug and drain thecrankcase into a clean, graduated container.Drain the oil from both the suction and discharge ports ofthe removed compressor-(1) into the samecontainer. Rotate the compressor shaft to assist in draining thecompressor-(1). Measure and record the amount of oil drained from the removedcompressor-(1). This measurement will be used during installation of thereplacement compressor-(1). Note:The refrigerant oil in the A/C system must be balanced duringcompressor replacement. Note:Check the oil volume in the replacement compressor. The replacement compressor is shipped partially filled withrefrigerant oil. The amount of oil has to be balanced according tobelow. Before installing the compressor-(1) therefrigerant oil will have to be partially drained:Refer to the amount of refrigerant oil recorded during thecompressor removal.Subtract the amount recorded from the total system capacity.Refer toRefrigerant System Specifications. The difference between the total system capacity and therecorded amount is the calculated amount to be drained from thereplacement compressor-(1). Drain the calculated amount of refrigerant oil from thereplacement compressor.